Compare this with the History book in which we used to study in Lebanon. Danish students could soon be allowed full access to the internet while sitting their final school exams if a pilot scheme goes well. They can use the internet to answer any of the questions, but cannot communicate with each other or with anyone outside the classroom. Posted: November 7th, 2009 under News. I am not going to talk about the internet and its possibilities since we are all aware of it by now (at least you who’s reading this blog), but I want to mention specifically the way artists generate their profits directly or indirectly through the internet. The business model for artists revenues that largely dominates the internet goes by the following: You get what you pay for. If you want a song, you go through iTunes and download the song after paying for it. If you want to read a book, you go to Amazon.com and buy it. We find a lot of free material on the internet, but when it comes to artists work, the freebies somehow disappear. I, and many others, have always imagined a different approach for artists getting their profits through the internet. The idea goes by the following: You try out the artist’s product, and if you like it you support the artist out of goodwill. One would directly say but noone would pay for something after he gets it for free! I agree, that’s why I think this approach is idealistic, and might not work well in reality. By coincidence, I have been notified by a friend of mine about Paulo Coelho’s speech at the Frankfurt Book Fair last October. Paulo Coelho is a Brazilian lyricist and novelist, known for his mind awakening novels such as The Alchemist. His unique storyline stems from his deep spirituality; It is said that he achieved self-awareness and a spiritual awakening while walking the 500+ mile Road of Santiago de Compostela in Northwestern Spain. Surprisingly enough, he shares similar thoughts about the internet as I do. He believes in the internet as a medium for positive growth for artists. In his address to writers, he says “use the web to promote and you will see the results in the physical world”. He has adapted himself by connecting more directly with his readers through his blog that he updates daily, and by uploading once a month during 2008 one of his titles, unabridged, to be read online. His sales have actually grown more after he published his books online. It makes me wonder that probably his readers decided to buy his books after reading them online. 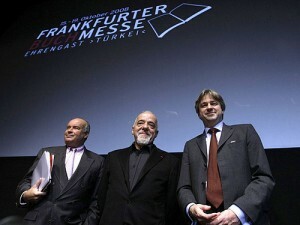 Read the Opening of the Frankfurt Book Fair speech on Paulo Coelho’s Blog. Posted: January 29th, 2009 under Cultural.